Ahead of a Sept. 30 deadline, Congress returns this week with just four legislative days to reconcile differences between the House and Senate legislation, pass the bill through both chambers and send it to the president's desk before safety net funding dries up. Additionally, the 2014 farm bill was passed when commodity prices were at a record high. Since then, the agricultural industry faced an economic downturn as commodity prices plummeted, resulting in a 50 percent drop in net farm incomes across the U.S. since the last farm bill, according to the U.S. Department of Agriculture. But the legislation, which must be renewed every five years, is partly hamstrung in Congress on an issue that has little to do with Texas farmers: whether to install new work requirements for recipients of the Supplemental Nutrition Assistance Program (SNAP), formerly known as food stamps. The House included a provision in its version of the farm bill that mandated that nonexempt able-bodied adults aged 18 to 59 work or participate in job training programs for 20 hours per week, a more stringent requirement than the current requirements under SNAP. It also removes the exemption for adults with children age six or older and provides federal funds for employment and training programs the House bill requires states to offer. A Congressional Budget Office analysis of the House bill found that 1.2 million would lose benefits by 2028 under the House bill. Democrats in both chambers strongly oppose increased work requirements and it is unlikely a bill with work requirements could pass the Senate. More than 3.7 million Texans benefit from the SNAP program, according to the Texas Department of Health and Human Services. However, those work requirements in the House bill are a major sticking point for U.S. Rep. Mike Conaway, R-Midland, who, as the chairman of the House Agriculture Committee, is a key architect of the House bill. There is no timetable for the release of the revised bill, nor the provisions it will include. But both Democratic and Republican committee aides in the House and Senate told the Tribune Congress still aims to pass the bill by the Sept. 30 deadline. The pressure is now on Conaway with just four legislative days remaining before the 2014 farm bill expires. The lone Texas Democrat on the committee, U.S. Rep. Filemon Vela of Brownsville, said House Republicans aren’t showing much willingness to budge on work requirements. “Up until this point, it seems as though there isn’t a big willingness from House Republicans to be swayed, but if they want a farm bill, something has to give,” Vela said in an email to the Texas Tribune. But the biggest challenge facing Conaway now is the complex coalition of rural Republicans and urban Democrats required to move the bill through Congress. The House bill narrowly passed its version on a 213-211 party-line vote in June on its second attempt. But House Democrats, like Vela, won’t support a farm bill with the work requirement provisions. When the House returns Tuesday, it also has to pass measures to avert a government shutdown on Sept. 30. On top of all that, President Donald Trump is now a potential wildcard after insisting in a recent tweet that the farm bill include work requirements and potentially setting up a showdown between Congress and the White House depending on the final bill. "Senator Debbie Stabenow and the Democrats are totally against approving the Farm Bill," Trump tweeted on Sept. 13. "They are fighting tooth and nail to not allow our Great Farmers to get what they so richly deserve. Work requirements are imperative and the Dems are a NO. Not good!" In 2007 and 2012, Congress failed to pass a farm bill by its deadline, resulting in multiple short-term spending packages until Congress and the president agreed on a full bill. It took 18 months for the chambers to agree on the last farm bill. Vela said if Congress doesn’t meet the Sept. 30 deadline this time, then Congress will pass another extension. Short-term extensions, Adams said, leave too much uncertainty for Texas farmers. 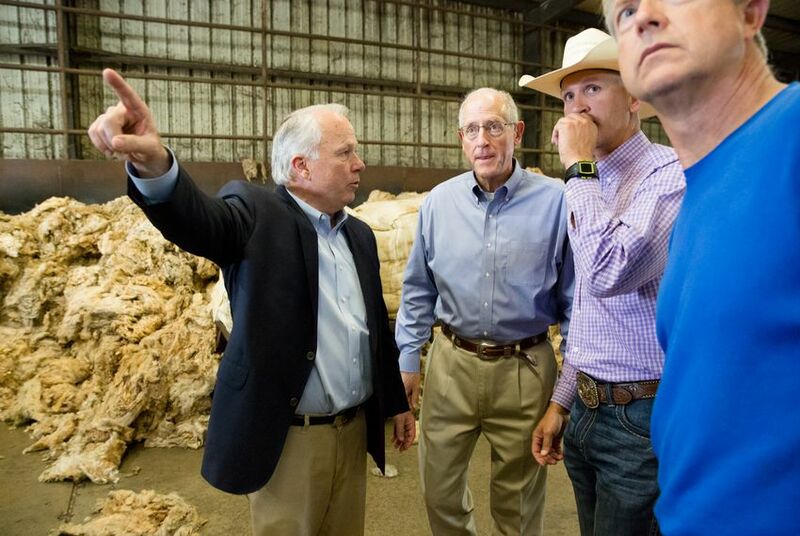 Correction: An earlier version of this story incorrectly stated when term limits would force U.S. Rep. Mike Conaway to relinquish his chairmanship of the House Agriculture Committee. House Republican term limit rules would allow him to stay in the role until 2020. Disclosure: The Texas Farm Bureau and the Center for Public Policy Priorities have been financial supporters of The Texas Tribune, a nonprofit, nonpartisan news organization that is funded in part by donations from members, foundations and corporate sponsors. Financial supporters play no role in the Tribune's journalism. Find a complete list of them here.